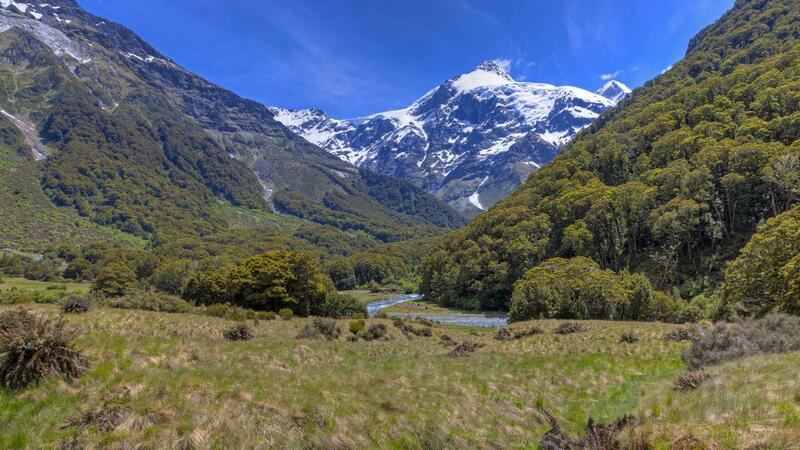 The 4 day Mt Aspiring Wilderness Hike is a trip into the heart of the of the Mt Aspiring National Park. This is a true New Zealand wilderness experience involving travel through alpine valley systems, walking through beach forests, crossing rivers, visiting glacial lakes, and viewing snow capped glaciated mountains towering above the valley floor... truly spectacular! Queenstown Mountain Guides use a fixed wing aircraft or helicopter to fly into the Wilkin Valley. From here it is a two hour hike up the valley to Top Forks Hut. At the end of the trip we will hike back down the Wilkin Valley and take a jet boat for the ride out, an awesome way to end the trip! The Mt Aspiring Wilderness Hike is also suitable for families and can be tailored to your groups fitness level, previous experience, and thirst for adventure. It is possible to make long days exploring the high glacial lakes, or to simply enjoy the lakes, rivers, beach forest, and scenery closer to Top Forks Hut. This glacial carved landscape of the Mt Aspiring National Park is host to a wide variety of interesting flora and fauna. The Silver beech is the valleys most dominant tree. Above the bush line you will find snow tussock grasslands and herb fields with alpine flowers including mountain buttercups and daisies. You are likely to see a wide variety of birdlife including the South Island Fantail, Rifleman, Bellbird, the Yellow Crowned Parakeet, the Mohua (Yellowhead), and possibly the New Zealand pigeon.